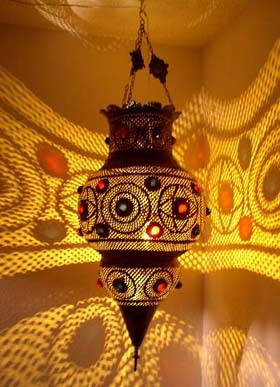 Description: This exotic and unique extra large copper chandelier is hand hammered in Marrakesh - Morocco. Traditional moorish palaces & homes in morocco still use these kind of chandeliers, you can see these chandeliers also in Hotels, restaurants...this chandeliers has an antique look. It will give a special athmosphere to any home. Medium size 33" x 16"